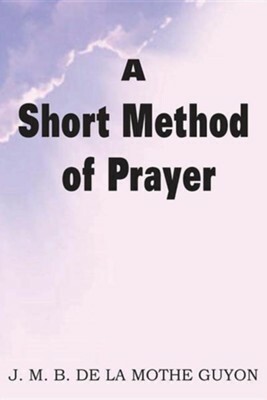 A Short Method of Prayer, was written for those who want to love God with their whole hearts. It gives simple instructions in contemplative prayer, prayer without words or distinct ideas. It encourages readers to accept all things as from God's hand. "If this book treats of nothing else but the short and easy method of prayer, it is because, being written only for that, it cannot speak of other things. It is certain that, if it be read in the spirit in which it has been written, there will be found nothing in it to shock the mind. Those who will make the experience of it will be the most certain of the truth which it contains. "Jeanne Marie Bouvier de La Motte was born near Paris in 1648. She was a sickly child who married a wealthy neighbor (22 years her senior) when she was 16 years of age. At 28 she was a widow with three small children. At age 47 she was imprisoned because her writings about God and prayer ran contrary to the established church of the time. She lost her freedom for 7 years during which time she continued to write about the God she loved. I'm the author/artist and I want to review A Short Method of Prayer.